Happy Friday! Hopefully Fall is still in the air where you are! We're supposed to reach the 60's this weekend. This weeks Bloggers Challenge is to create something with a Fall Theme. To create my card, I used the Spectrum Roll Technique and Pumpkin Patch Ink to Brayer a piece of Heavenly White Card Stock, then heat set. I stamped the 3 Step Autumn Squirrel as follows: #3 Memento Black, #2 Memento London Fog, #1 Memento Desert Sand, then added some leaves in Pumpkin Patch from the Multi Step Owl & Autumn Moon. I distressed the Eclipse Black Panels, and layered them on a piece of Basis Yellow for a bit of pop. I stamped the sentiment "oh Nuts, I forgot" from the 3 Step Autumn Squirrel in Black on the Basic Grey Indian Summer Pattern Paper. Thanks for stopping by, have a great weekend! For more Fall inspiration, click on the Bloggers Challenge Logo on my sidebar. Oh my gosh, your squirrel is SO fantastic!!! Thanks for sharing the color combo!!!! This is beautiful! I love your work Lisa. That designer paper is fantastic. I just love what you do with these images. Great card - and such funky, fun paper! Way cool! Love the background paper! Lisa, I love that you used some bright colors for this fall card! What a beautiful piece..Lisa..thanks for the challenge. I am still petting my Basic Grey paper..love how you stamped the squirrel. Fantastic Card. The Squirrel looks awesome. - Every time I see a squirrel now I think of that line from this new comedy movie (I hate Squirrels) I really don't though but you know how it is when you get something stuck in your head. What a cute little squirrel! Love the designer paper! Sammy Squirrel is so cute on the amazing paper! I gotta have him! Too cute, another one of those great images, I have not given in YET! Love the squirrel and I love the theme. I've been busy rushing into Christmas so you challenge forced me back into the current season. That is fabulous, Lisa! 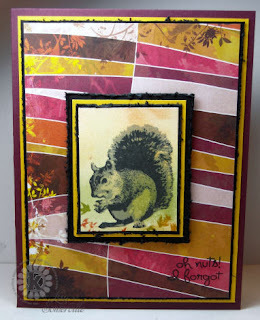 I just love the depth that you have with that wonderful paper and the layered colors of the squirrel! Great vibrant card, Lisa! So realistic looking squirrel, too! What a colorful card!!! Great job! Fantastic background for the squirrel, Lisa. Great technique for the background. Such a great job on the squirrel!